Serious thanks go out to Don Peters for this wonderful piece of writing, and for the GREAT photo! 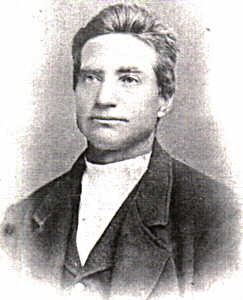 JOHANN CARL PETERS (Gaitchen) and his wife, ANNA MARIE and their one-year old daughter were among a new wave of German immigrants who would start arriving the fall of 1865. As bad as conditions must have been in their home land, it's a good thing Johann and Anna Marie didn't know just what hardships lay ahead of them as they embarked for America - first, a month or more on a (non-luxury) ocean steamer to New Orleans, and then packed onto a river steamer to St. Louis. They settled just across the river from St. Louis in Madison County, IL near a place called Leer, a location not identified on current day maps. They worked as farm hands to others who had arrived earlier. Life was not easy, and opportunities to get ahead were limited because available land was scarce and farm prices had risen sharply. Their second child had arrived in 1886, and some time following the birth of their third child in early 1889, they decided to move on to the Nebraska Territory just west of Missouri. Some Ostfriesens arriving in Madison County before the Civil War, had preceded them to Nebraska in the early 1860's, acquiring choice farm land under the Homestead Act. These included names like Rieke Arends, John Behrends, Ocke Bruns, John Renken, Herman Neeman, John Stromer, and Hermann Teten. With Johann's family and many others to follow, there was soon a large colony of their countrymen resettled in Nebraska. "They (the Tetens) were possessed of but limited means when coming to Nebraska, and on account of this, they walked from Nebraska City to their present home, a distance of 20 miles. They were also obliged to carry their little child, and a few of the goods which they had found necessary to bring with them. In addition to the weariness of travel, they had scarcely anything to eat during the whole journey, and but a little milk and impure water to drink. They made this memorable journey in one day, and when arriving at their destination took shelter in a small shanty. At this point the people around them were as poor as Mr. Teten himself, and could render them but little assistance. They experienced very many hardships during the first year. That summer, he worked all through the harvest time for fifty cents a day. But with the money he was able to save, he purchased a cow, his first livestock. The following winter was exceptionally cold and their survival was threatened, but they somehow all made it through"
The Teten biography goes on to report many successes in his life. For Johann however, fate was apparently not so kind. Enclosed copies of U.S. Census Reports showed him in 1880 with personal worth of $40 and a farm laborer, and in 1880 as a farmer. A short time later for some unknown reason, he decided to leave whatever he was doing, and moved his family 100 miles away to Columbus, Nebraska. Tragedy struck in 1884 when both Anna and 9-year old Karl, contracted and died of typhoid fever. Obviously devastated, he and the remaining children (ages ranging down to 2) moved back to the Talmage area where they took up residence with his oldest daughter Gesche Margaretha (Maggie) and her husband John Brokens in a four room log cabin. Many of the older children were farmed out to stay with other local families as helpers. Thirteen year-old son, Henry (of our family line) went to the home of "a Teten family" where he apparently received excellent mentoring and tutoring. Germany's population increased rapidly during the period following the Napoleonic Wars which ended around 1815. It's industrial development was still afar off, and its mostly agricultural economy could not absorb the population growth. A severe decline in the standard of living, even in the less populated Northern part of the country (including Ostfriesland) caused younger generation Germans to leave home and country to escape the poverty. Over 4 million departed Germany from 1840 to 1890 - 90 percent going to the U.S. in search of cheap land. They represented about 30 percent of all immigrants entering the U.S. during that period. Church records in Horsten show that Johann Carl was barn Sept. 9, 1837 to (never-married) man and maid servants, Johann Peters Krey and Engel Marie Gertes. Engel Marie later married a Harm J. Godjen who, as his stepfather, gave Johann the added name "Gaitchen." When he came to the U.S., Johann apparently dropped the latter, but mentioned it to family members who never really understood where it came from. Etzel Church records show Anna Marie, his wife, was born in May 6, 1841 in Etzel-Hohejohls to Gerd Janssen Teten and wife Gesche Margarete, born Focken. The Chart on page 14 shows more completely the linages of both her and Johann. Johann and Anna Marie were married in Etzel on Sept 24, 1864, and with 7 month-old daughter Gesche Margaretha already in hand, they probably would have wished to start their new life in the U.S. sooner than allowed by the 1864-65 U.S. Civil War restrictions.